The Tunze Turbelle Safety Connector allows for safe connection to pumps. 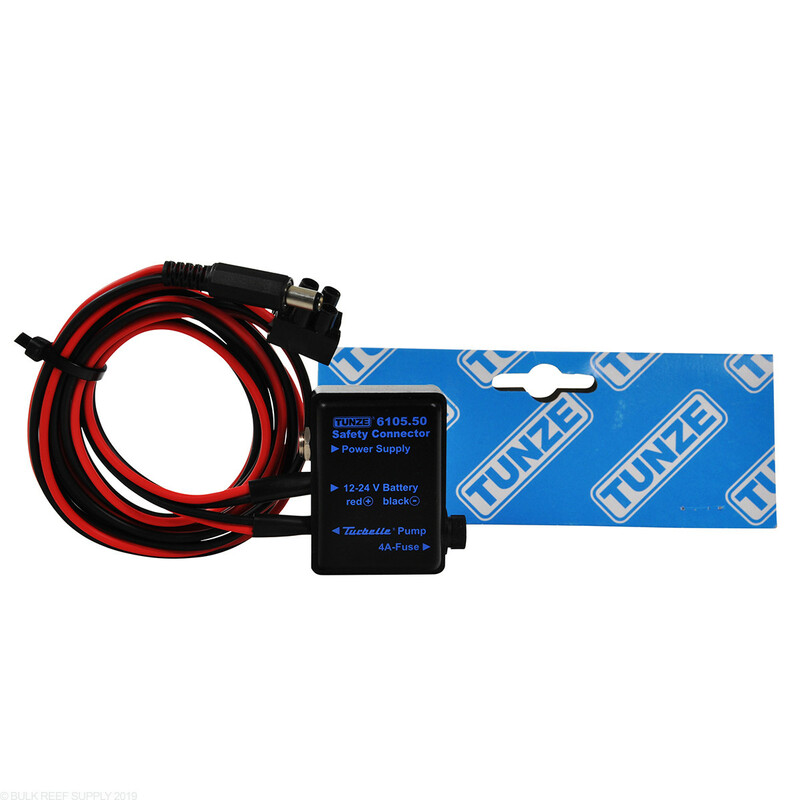 It contains a 4 Amp fuse and permits normal operation with the Tunze power supply unit. In case of a power failure, it will automatically switch over to a battery or another direct-current source. In South Florida we’re always worried about power outages from storms. While I have a bigger backup setup for hurricanes, for strong storms when I’m not home this has really helped me keep peace of mind. It works perfectly as it pops over to the backup. I use a small utility battery with 35 aH running on two turbulle 6105s. Will this work with Vortech battery backups and Tunze pumps? Tunze pumps are a great choice, but they are not compatible with the Ecotech Battery Backup. 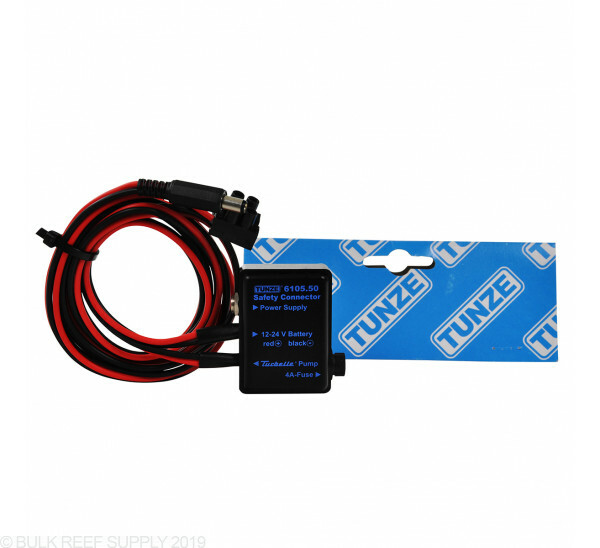 Tunze pumps use the Tunze safety connector and then can be connected to a standard 12V battery that you can find at your local battery center or hardware store. That and a cheap trickle charger can actually cost less than the battery backup from Ecotech. Will the Tunze Turbelle Stream Controllable 6105 Pump connect to a ICECAP battery back up ? What should I use to connect the safety connector to a battery? To connect to the battery many people have used battery clamps in a smaller size which have been modified to clamp onto the battery as well as the other end cut to connect to the safety connector. How many Tunze pumps can be used on one safety connector? When on battery mode, do the pumps reduce power to save battery life? One safety connector can attach to a Tunze pump. The 4 amp fuse keeps the power consistent and does not run a power saving mode. Feel free to let us know if you have any further questions! Hello, will this work with ecotech MP10 ? The connector is designed for use with Tunze pumps. unfortunately the Ecotech pumps are not recommended for use with the Connector. Feel free to let us know if you have any further questions!